Super Hero Boy: The Joobles are totally huggable! The Joobles are totally huggable! There are some toys that just arrive and you greet them with open arms and open hearts as you just know from the moment you see them that they are destined to become special companions. When our new Joobles Bunny arrived I knew a match was made. Connor's plush collection is pretty exciting as from the beginning I've tried to collect interesting characters for him to play with. As a child my plush "friends" were really a special bunch to me. We moved often enough that real friends were sometimes scarce and it was sometimes a bit scary being in a new place. My furry friends were a huge comfort to me and I still have some of the more special ones today. I treated them like they were honored guests in my life and even went through a phaze where I couldn't sleep unless every single stuffed animal I owned was in the bed with me, thank goodness I had a queen sized bed as a seven year old. So when I found out I was pregnant with Connor I started searching high and low for really unusual and memorable plush for him to treasure. I'm a firm believer that the toys and items that we have around us growing up really influence who we become or least leave their mark on us forever. Textures, colors, fabric, unusual shapes, things that break us out of the normality of life are all wonderful and even comforting things. So the toys and plush animals that we most treasure are the ones that are a little different from the rest and I am especially excited about toys and plush that are ecofriendly, organic, and participate in fair trade. Connor may be too young to understand any of the above quite yet but one day the fact that his favorite toys and plush friends were made in such a manner may just inspire him to live a more world responsible life. Not to mention having great toys sparks the imagination and my biggest wish for my son is that he follows his own path not one that he feels that I or anyone else lays out for him. Our new bunny, Bella, from Joobles is everything I look for in a toy. 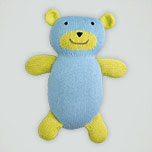 Incredibly soft made from brightly colored organic yarn. She was hand crafted in Peru, possibly by another mother or father who is being paid a fair wage for making my son's new friend. For those of you that do not know what fair trade is, I'll explain in a simple version. In way too many cases if you buy an item that was made in another country, especially developing countries, all too often workers are not paid a livable wage to make the items. Meaning factories will hire desperate workers for little to nothing and they end up having to work 18 hours a day just to barely and I do mean barely feed their children. Fair Trade means that workers that make the products are paid a fair wage, or you could call it a living wage, meaning that instead of paying them the bare minimum for their time they are paid a wage that is "fair" in their country, a fair wage would be similar to what we would consider a living wage here. For instance for those of us who have worked for minimum wage here in the US know just how bad that can be.. well I assure you that a minimum wage in some other countries is far far worst. So imagine being a family without a job, without running water, without anything more than a shack to live in and you are suddenly given a job where people actually care. That's the whole idea of fair trade in a very tiny nutshell. 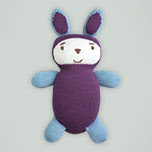 The Joobles line is adorable regardless of where or how they are made but knowing that our new bunny was made in the fair trade system leaves me with a warm fuzzy feeling. I also love the fact that one day when Connor is old enough to understand we can get out a book and read about Peru and talk about where his bunny was made and talk about some of the aspects of fair trade and organics. One thing that really surprised me about the Joobles when Bella arrived is I did not at all expect her to be so big. She is a good 11 inches tall and fairly plump so she is about the size of a classic teddy bear and stuffed with super soft cotton which makes her super squeezable which is just right for hugs. Compared to other knit plush I have seen $29 is a really good bargain as I have seen very similar toys selling for double that price in the same size range. If your interested in learning more about fair trade, the Joobles line including the super cute matching hoodies, or finding more ecofriendly and fair trade items a great place to start is Fair Indigo! I have been thinking, too, that these have been looking VERY soft and squishy!! thay are so verry cute.